Need a home inspection in Bellevue? Bellevue, Washington is a city located in the Eastside of King County, Washington, and is often characterized as a suburb, edge city, or satellite city. Many people living in Bellevue work in Seattle, and vice-versa, blurring the distinction between Seattle and Bellevue. Bellevue traces its history back to 1869, when the area was first settled under the Homestead Act. However, the area remained very rural until the Lake Washington Floating Bridge opened in 1940, expanding the area for further development. Today, more than 144,400 people live in Bellevue, which makes up part of the Seattle Metropolitan Area, which contains more than 3.9 million people. Bellevue is an affluent community, with a median family income exceeding $104,000. It’s also one of the safest cities in America, with very low crime rates. Many major companies are headquartered in Bellevue, such as video game companies Valve and Bungie, as well as Amazon.com, Eddie Bauer, T-Mobile USA, Quality Food Centers (QFC) and ArenaNet. Some other major companies also have regional branch offices in Bellevue, including Boeing, HTC Corporation, and Microsoft. The city also has numerous thriving commercial shopping centers. Bellevue has a strong transit system, partly because increased traffic congestion has made it difficult to drive into the city. Currently, King County Metro and Sound Transit Express operate the Bellevue Transit Center, and a Light Rail system is being planned for Bellevue in the future, through the Link Light Rail system. Major highways and roadways in the area include State Routes 520 and 202, and Bellevue also has access to the I-405 loop. Schooling in the area is provided by the Bellevue School District, which is regularly ranked as one of the best public school districts in America, and serves nearly 20,000 students. There are also a large number of private schools in the area, as well as Bellevue College and City University of Seattle for post-secondary education. 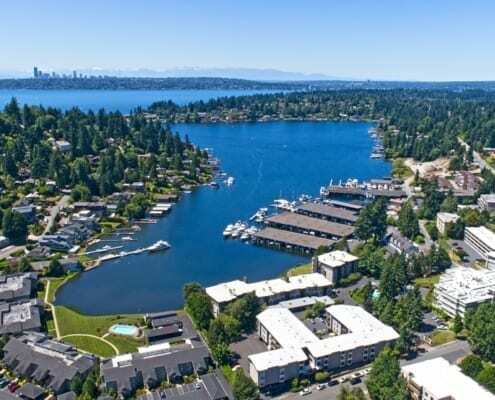 Bellevue is one of the best places to live – not just in Washington, but in the entire United States. But if you’re still not sure about what to expect when you move to this city, or need more information before you make your move, here are a few helpful resources you can use to learn more about the city, schooling, jobs, real estate, and other such things. Ready to make your move to Bellevue? You’ll want an experienced, reliable, and professional home inspector on your side, whether you’re moving from within Washington, or from elsewhere in the country. And at Key Inspection Services, we specialize in home inspections in Bellevue. We leave no stone unturned during the inspection process, to make sure you’re aware of any potential issues related to your home purchase. To learn more, please contact us right away. Ready to get started? Feel free to schedule your appointment online now.